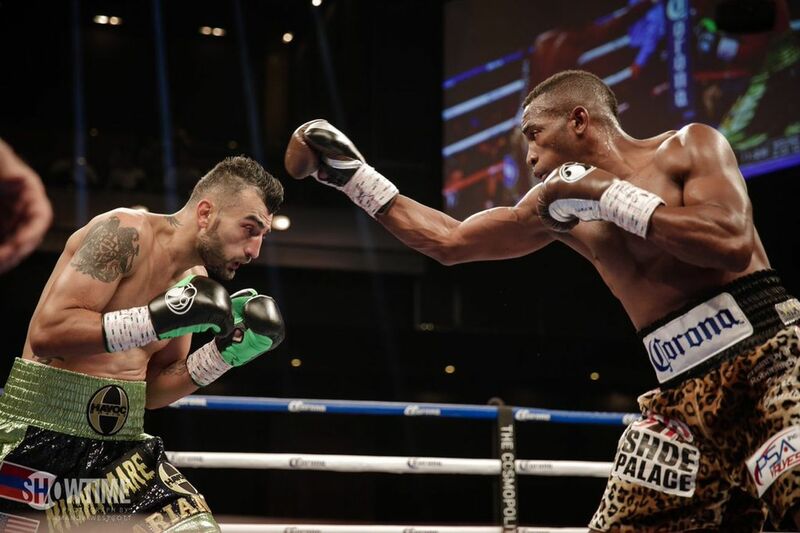 Erislandy Lara (23-2-1, 13 KO) appeared to be on his way to trouble in the first round but got his bearings thereafter and gradually pulled away from Vanes Martirosyan (36-3-1, 21 KO). Martirosyan landed his right hand consistently on Lara in the opening round, pushing him back off balance each time from the impact. That was Martirosyan's best round: he was accurate, lead and countered, and troubled Lara with his hand speed and quick reflexes. Lara was generally inches short with his left hand but busy with his jab. In round two, as Martirosyan was less busy, Lara started to land his left hand as he was then able to throw it from a closer distance. Martirosyan re-gained the momentum in the next round with consistent blows to the body, most landing cleanly and some low. In particular, the left hook to the flank landed at will around Lara's guard. Rounds four, five, and six were all fairly competitive; it seemed as if Lara edged them. Lara controlled the pace, landed his left hand to the face while Vanes continued to land downstairs. Lara won the next two rounds more convincingly. There was more variety in the angles at which he used his left hand, occasionally sweeping around the guard of Martirosyan. Vanes came back and took round nine on activity with his work primarily done to the body. Towards the end on the tenth round, Martirosyan was warned for a low blow that was actually deflected low by Lara; however, he had been repeatedly hitting below the belt throughout and so a warning was overdue. Unfortunately, Martirosyan was deducted a point for a punch on the belt line in round eleven. Whereas it is easy to criticize the referee, this was truly Martirosyan's doing as his repeated fouls conditioned the referee to not give him the benefit of the doubt on close calls. One could argue that Martirosyan took the final round on activity. Lara out landed Martirosyan 162-94 in total punches and won a competitive unanimous decision 115-112, 116-111 x2. To be honest, Lara should not be criticized too much for his low output here. For Martirosyan posed a tough style for Lara – quick hands and reactive countering with power. A trilogy with Lara is not likely any time soon, but Martirosyan gave a good account of himself in defeat and one can presume that after another win or two he may get an opportunity at one of the Charlo brothers – he had previously lost a competitive decision to Jermell Charlo in which he also performed well.